MONTPELIER – In the face of pressure from all sides to both improve Vermont’s educational system and curb spending on our children and families, Governor Phil Scott has issued a press release that suggests he is planning to unveil a drastically reduced education budget, but that the huge cuts are not entirely his doing. In the release, Gov. 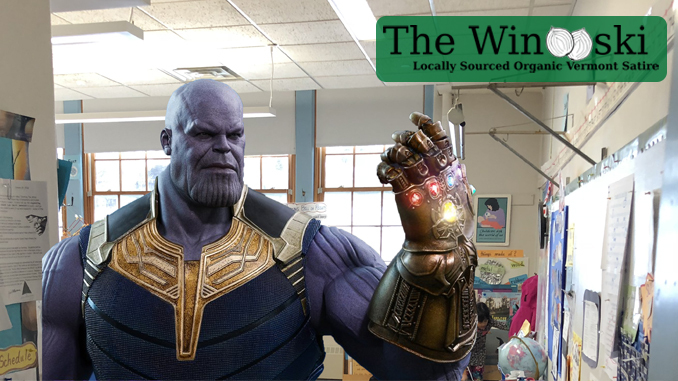 Scott references education spending that may be down to just over half of 2018 levels, but says that this new plan is the doing of Thanos, the Mad Titan. The release fails to explain exactly how Thanos is responsible for the sudden loss of funding, stating very clearly that any details would be “spoilers,” but Gov. Scott expects many other areas of government spending to be similarly reduced. The declining number of Vermonters is cited as a related reason for the budget slashing, but the release would not say how any of this was connected, saying only that residents should wait until part two of the press release comes out next year before judging the fiscal plan. The Governor strongly urged lawmakers to pass a spoiler-free piece of legislation that would align with his plan without including any details ahead of time. Although unusual, this fits with the Governor’s usual style of spoiler-free legislation, in which he waits until the last possible moment to submit thoughts, plans, and critiques. Captain Marvel for Vermont Governor!!! Um, is part of the satire the way the story is totally obtuse? It makes no sense to me. That’s probably part of it. I think I picked it up in the last half of the last paragraph, but I’m not sure. A lot of things Scott says baffle me. Mac- Oscar Wilde completely agrees with you. About 120 years or so ago.